Youve heard our name, youve seen our records, our t-shirts and our stickers. Were probably the favorite band of someone you know and yet maybe were still a mystery to you. 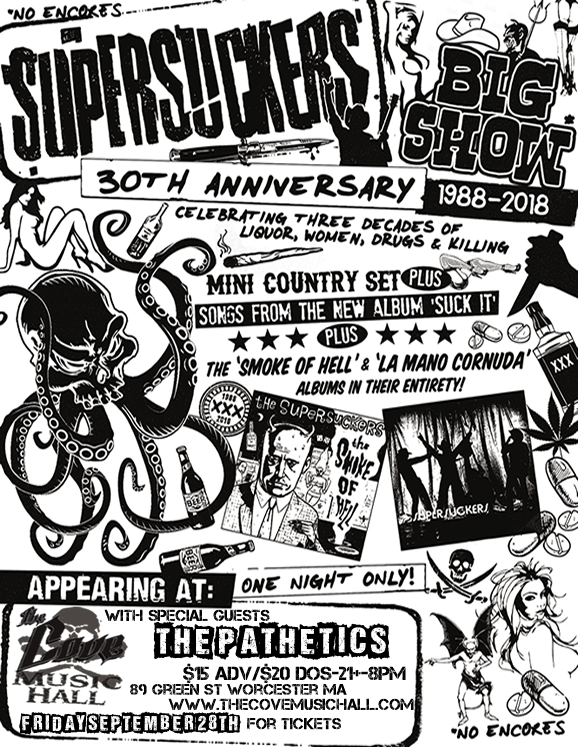 Well my friend, thats okay, youre at the right place to get to know the greatest rock-n-roll band in the world, The Supersuckers. The Pathetics were formed in 1997 by Rich Lorion and Dave Strandberg, once dubbed the Lennon and McCartney for morons. With a love of the Ramones, punk rock, and drinking, the two set out to write catchy punk songs with a twisted bent. Drummer Chris Arundel was brought on board and the first record, Not Quite Right, was released in 1998. Soon after the record was launched, Jim Bain, who produced Not Quite Right, joined the Band on guitar and vocals, rounding out the groups sound. After much touring, Arundel was replaced by Rich Scales, of The Feerless Leaders, and Taste Like Chicken Was recorded and released in the fall of 2002. In Spinal Tap-like fashion, Scales was soon replaced by Dirty Walter, singer/guitarist from the Brainless Wonders, who took a temporary stint behind the kit, before the band finally settled on former Grimace drummer, Jeff Staltare as the band's permanent time keeper. In Staltare the band seems to have found the perfect match and a great addition to the writing process. His first recording with the Pathetics is on Didn't Mean to Offend you in 2008. Around this time the band focused on live shows and releasing some singles, most notably the Christmas Classic, Mistletoe Belt Buckle. After some down time and rumors of a split, The Pathetics reemerged in 2015, better than ever and have a new record due out in 2018.